We’re proud to announce that The Superlatives: Shattered Worlds, the latest in our popular “Choice of Games” line of multiple-choice interactive-fiction games, is now available for Steam, Android, and on iOS in the Choice of Games Omnibus app. It’s 33% off until April 4th! Conquer assassins and alien invaders in Superlative London! Defend Earth and negotiate interplanetary peace as you race to rescue Queen Victoria in this thrilling sequel to The Superlatives: Aetherfall. It’s also 33% off until April 4th! 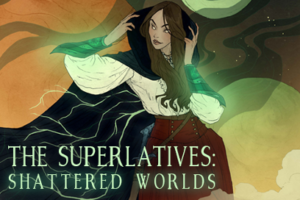 The Superlatives: Shattered Worlds is a 218,000-word interactive novel by Alice Ripley. It’s entirely text-based, without graphics or sound effects, and fueled by the vast, unstoppable power of your imagination. You are the Arbiter, a planet-hopping operative assigned to stabilize a peace summit between Mars, Venus, and Earth. But when Queen Victoria is targeted for assassination, you must find her killer, unmask the Mysterious Officer he serves, and stop an otherworldly invasion before it’s too late! Armed with powerful aetheric artifacts and your own wit and skill, you’ll fight alongside your allies to unravel the mystery of this new threat, defend your home planet, and face a final foe both strange and strangely familiar. Your employers, the shadowy body known as the Divergent Conclave, are dedicated to maintaining peace between the planets. Impress the Conclave and its members might help you protect Earth—or recruit you to serve their personal agendas. Will you manipulate them to gain their support? If the peace summit falters, will you placate the parties, or choose a faction? How will you stop the impending invasion? And who will you romance? What started as a job of politics and diplomacy could end in murderous chaos. Face aliens, automata, and whole new worlds on a quest to save the solar system! • Cultivate your reputation among cats…or is it just one cat? We hope you enjoy playing The Superlatives: Shattered Worlds. We encourage you to tell your friends about it, and recommend the game on Facebook, Twitter, Tumblr, and other sites. Don’t forget: our initial download rate determines our ranking on the App Store. The more times you download in the first week, the better our games will rank.